The combination of embossed ornaments has turned this model into a beautiful picture, turning the head of everyone. 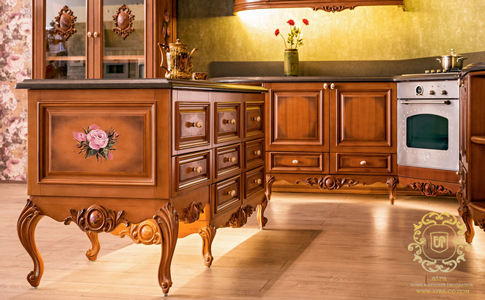 Elizabeth was the first queen of Britain, and this fully wooden cabinet is inspired by the authentic British style. 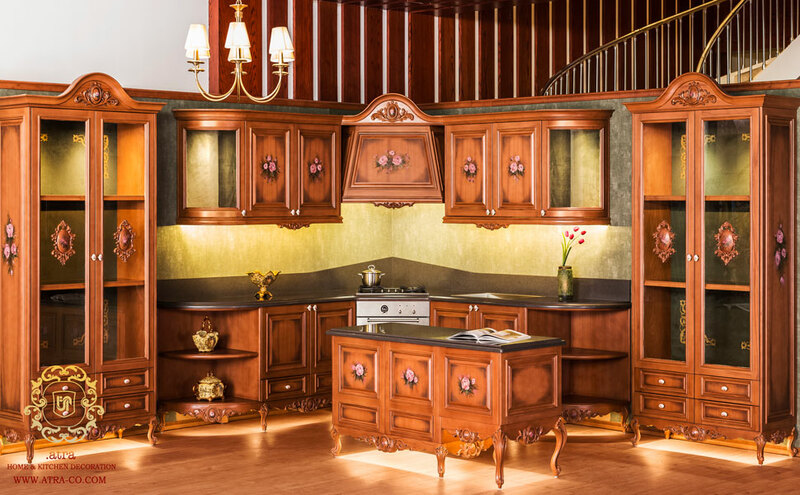 The use of hand-drawn patterns on the cabinets and handles gives the job an artistic aspect. The shapes are performed by the design team, with all rights belonging to the Atra group. The wood is rasch, which is a robust, semi heavy wood type, resistant to insects and fungi. In this sample all engravings are seamlessly performed (for better resistance, prevention of cracks and improved aesthetics). For better quality, all interior walls of the units use wood veneer. One of the other features of this kitchen decoration that makes it unique is the replacement of foot area (toe kick) with chair-style legs, making it all the more appealing. According to the design style (traditional British), the lightings are classic halogen, instead of linear, modern SMD.